The Southern Ocean ecosystem at the Antarctic Peninsula has steep natural environmental gradients, e.g. in terms of water masses and ice cover, and experiences regional above global average climate change. An ecological macroepibenthic survey was conducted in three ecoregions in the north-western Weddell Sea, on the continental shelf of the Antarctic Peninsula in the Bransfield Strait and on the shelf of the South Shetland Islands in the Drake Passage, defined by their environmental envelop. The aim was to improve the so far poor knowledge of the structure of this component of the Southern Ocean ecosystem and its ecological driving forces. It can also provide a baseline to assess the impact of ongoing climate change to the benthic diversity, functioning and ecosystem services. Different intermediate-scaled topographic features such as canyon systems including the corresponding topographically defined habitats ‘bank’, ‘upper slope’, ‘slope’ and ‘canyon/deep’ were sampled. In addition, the physical and biological environmental factors such as sea-ice cover, chlorophyll-a concentration, small-scale bottom topography and water masses were analysed. Catches by Agassiz trawl showed high among-station variability in biomass of 96 higher systematic groups including ecological key taxa. Large-scale patterns separating the three ecoregions from each other could be correlated with the two environmental factors, sea-ice and depth. Attribution to habitats only poorly explained benthic composition, and small-scale bottom topography did not explain such patterns at all. The large-scale factors, sea-ice and depth, might have caused large-scale differences in pelagic benthic coupling, whilst small-scale variability, also affecting larger scales, seemed to be predominantly driven by unknown physical drivers or biological interactions. 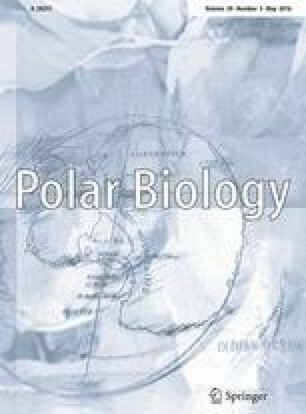 This article belongs to the special issue on High Environmental Variability and Steep Biological Gradients in the Waters off the Northern Antarctic Peninsula, coordinated by Julian Gutt, Bruno David and Enrique Isla. Thanks are due to the SCAR biology programme ‘Antarctic Thresholds—Ecosystem Resilience and Adaptation’(AnT-ERA) due to financial support of a post-expedition workshop held in Dijon, France, in 2014 and to the Deutsche Forschungsgemeinschaft for financial support of project JA-1063/17-1. ME was funded by the Actions thématiques du Muséum ‘Emergences’ of the Muséum national s’Histoire naturelle, Paris, France, and the Institut polaire français Paul Emile Victor (IPEV). Satellite data were provided by NASA (SeaWiFS, MODIS), ESA (MERIS, GlobColour) and PHAROS Group of University of Bremen. Marcus Huntemann (University of Bremen) helped with the extraction of satellite sea-ice concentration data. Support of cruise participation of PLG, IMB, NT by Spanish Project ECOWED (CTM2012-39350-C02-01).